Copious wastewater is generated in food production. Effluent characteristics and constituents vary widely and require different processing technologies to achieve the required discharge limits. Discharge limits vary further by state and local regulations. Food production plant waste streams contain large chunks which require separation. The simplest and most economic process for removing these solids is screening. A number of screen designs exist and facility layout should be a basis for the selection. Models include rotary drum screens, climber screens and channel screens with shaftless conveyors. Screened effluent is sent to an equalization sump. It may be combined with streams not requiring screening. The various waste streams are seldom continuous in either quantity or quality. 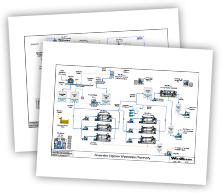 Process flows may vary by shift, by product and by cleaning schedules. Stream flow equalization is almost always advantageous. Equalizing flow rates also reduces wastewater treatment equipment size and cost. Some plants produce high amounts of fats, oil and grease (FOG). A dissolved air flotation (DAF) unit is an effective means of reducing the FOG and solids levels. DAFs are especially effective for food solids since most food particles float. Floating FOG and solids are skimmed from the DAF unit and recovered for disposal or sale. Skimmed solids do not require thickening. Total suspended solids (TSS), FOG, and biological oxygen demand (BOD) are all significantly reduced by screening and DAF treatment. Nevertheless, there may still be levels of these contaminants which will require further treatment prior to discharge. Contaminant type and level determine treatment options. Waste stream volume, reuse possibilities, and available space will also influence the choice of treatment designs. Almost all food processing facilities will require biological treatment for BOD removal. If the stream is small or BOD is low, the plant may elect to send the screened waste to a municipal treatment plant. Some wastewater will contain very high BOD (dairy, cheese, etc.) and anaerobic as well as aerobic systems will be necessary. A WesTech BioTreater™ is an aerobic treatment system that conserves real estate by combining a number of operations. BioTreater is a general term describing a variety of individual treatment processes. The basic concept is that of a tank within a tank using common wall construction. The central tank is normally a COP™ Clarifier which treats the effluent prior to discharge. The outer tank is divided into sections, each performing a separate operation. Operations may include: equalization, aeration, sludge storage, digestion, and anoxic treatment. Common tank wall design with separated exterior tank sections effectively reduces the tank footprint. Gravity-driven flow reduces the piping and pumping required resulting in capital cost savings. BioTreater sludge is then dewatered on a filter press. A variety of waste streams can be fed into the anaerobic digester in order to reduce the amount required for disposal and to generate renewable biogas. Each type of waste may be received and fed to the digester utilizing slightly different methods depending on its digestibility and handling requirements. These mixers are an efficient and reliable way to keep the digester contents from stratifying. Since these unique mixers are reversible and can create upward or downward flows, they have a distinct advantage in preventing solids from accumulating at the top or bottom of the digester. A heat exchanger jacket can be added to provide some or all of the heat required without the need for a separate sludge recirculation pump. Hot water from the boiler (or recovered from cogeneration) is pumped through the external tubes while sludge from the digester is recirculated counterflow through the inner tubes using special cast fittings. To ensure reliable performance, waste streams are not usually fed directly through the heat exchanger but are instead added directly to the digester to be mixed with the digesting sludge before being sent through the heat exchanger. Biogas is contained and stored at a constant low pressure inside of these specialized PVC-coated membrane structures. The outer membrane is kept inflated with small air fans. The inner membrane inflates and deflates depending on biogas demand and provides ample storage for any end use. Biogas contains several contaminants and through several processes, H2S, moisture, siloxane (and even CO2, if necessary) can be removed to provide a high quality renewable fuel that will not cause problems with the cogeneration equipment. The ability to blend biogas with a natural gas can provide many benefits for sizing of equipment and opens up a variety of options for more efficient and constant operation of the cogeneration equipment. These options for producing renewable energy and electricity from the biogas can be sized and selected based on gas production capacity and other site-specific factors. Efficiency and technology has improved substantially, making onsite cogeneration more feasible than ever before. This exciting option is most effective if there are fleet vehicles that operate at or near the fueling station. Offsetting gasoline costs may prove to be a very significant savings to your operation. High strength BOD wastewater is produced in a number of industrial processes. These include petrochemical, chemical, food processing, and pulp and paper plants. Biochemical oxygen demand (BOD) is the amount of dissolved oxygen needed by waterborne aerobic biological organisms to break down organic material. The BOD is a measure of organic water pollution. Biological oxidation has been used for decades to reduce BOD and remains the preferred treatment method. Anaerobic treatment is economical when the organic load and temperature are high and the wastewater lacks essential nutrients. Anaerobic treatment converts biomass to energy-rich biogas (methane) which may be used as fuel. Effluent from anaerobic treatment has low BOD, with corresponding minimal environmental disruption. Anaerobic reactors harness biological reactions and are sensitive to temperature and pH. They also require significant time to start up and recover from upsets. If influent levels of oil or solids are high, primary clarification may be required. This may be accomplished using either sedimentation or flotation prior to biological treatment. Evaluation of these processes is based on influent water quality, contaminant to be removed, and chemicals required for the biological process. Anaerobic pretreatment is typically indicated for BOD levels over 2,000 mg/L and temperatures over 25°C. Significant amounts of alkalinity may need to be added to maintain reactor pH. Biogas can be captured and used as an energy source to offset the operating cost of the plant. If biogas is not used as a fuel, treatment such as activated carbon may be necessary for odor removal. Control of pH is a critical component of any anaerobic process. Nutrients may need to be added. Industrial effluents often don’t contain all the necessary nutrients for biological growth. Nitrogen, phosphorus, and other nutrients must frequently be added to ensure biomass growth and BOD removal. Continuous flow, suspended growth aerobic systems are designed to handle continuous flow. They do not provide a bed for a bacterial film, but rely on waterborne bacteria. Suspension and aeration are typically provided by an air pump, which provides constant stirring in addition to oxygenation. This typically produces better effluent quality (lower BOD) than attached growth or anaerobic treatment. A medium to promote fixed film bacterial growth may be added to handle high levels of wastewater biomass. Adding anoxic zones can discourage filamentous bacterial growth, promote nitrification, and produce better settling characteristics. The effluent quality desired may raise the need for total suspended solids (TSS) or fats, oil and grease (FOG) removal through media filtration. If there are non-biodegradable organic constituents present, chemical oxidation may be employed to reduce chemical oxygen demand (COD). Waterborne pathogens and viruses require disinfection using chlorine, ozone, or UV light. Dewatering using a thickener, belt press, filter press, centrifuge, or drying bed reduces waste disposal costs. In a slaughterhouse, wastewater can be generated from a variety of sources: washing carcasses, processing offal, cleaning equipment, stockyards, any rendering process, chillers, vehicle wash facilities, etc. There also a number of noncontact sources: storm water, cooling water (vacuum pumps, air conditioners, compressors), steam condensate, etc. The amount of wastewater generated depends on the age of the plant (new plants tend to be designed for less water use) and the plant practices (i.e. wet vs. dry cleaning practices). The amount of wastewater generated can range from several hundred to several thousand gallons per head of cattle processed. Screening is the preferred pretreatment for almost every waste stream. Removal of large solids not only produces a source of renderable materials with monetary value, but also reduces the solids, biochemical oxygen demand (BOD), oils and grease levels requiring treatment by downstream processes. Screens accomplish this without the addition of chemicals and with minimum energy input. However, proper screen selection is vital to having a treatment system which is highly efficient and easy to operate and maintain. Screens must be designed to operate with a minimum amount of cleaning. WesTech offers a complete line of screens designed for each waste stream. A well-designed wastewater treatment system strikes a balance between streams which are best kept segregated, either due to recoverable byproducts or because of the difficulty and/or cost of treatment (i.e. blood, manure, etc. ), and streams which can be combined for the equalization of flow rates and levels of contaminants. Any wastewater treatment process performs best when treating a stream which is constant in its levels of constituents (either high or low). This is especially true with biological treatment. The number and type of microorganisms adapt to the amount and type of nutrients available. After screening and equalization, the majority of the wastewater is sent to a dissolved air flotation (DAF) unit where fats, oil and grease (FOG) are floated to the surface and skimmed off to a sludge holding tank. Heavier solids settle and are also sent to this same tank. These materials may have value as renderable materials. The water from the DAF is sent to biological treatment for BOD removal. The WesTech STM-Aerotor™ employs a combination of activated sludge and fixed film to consume the biological material. This allows the unit to better handle swings in contaminant levels associated with daily cleaning cycles and to survive weekend periods of low BOD levels. The effluent from the STM-Aerotor is processed the same as conventional activated sludge in a WesTech COP™ clarifier. From the COP clarifier, a portion of the sludge becomes recycled activated sludge (RAS) which is recycled back to the STM-Aerotor to maintain a high microorganism population. The remainder of the sludge becomes waste activated sludge (WAS) which is sent to a thickener. This unit thickens the sludge and discharges it to the sludge holding tank. It should be noted that the skimmings and sludge from the DAF are not sent to the thickener as they are already in a thickened state from the DAF and would not benefit from further settling time. Sludge from this tank is pumped to a filter press for dewatering. Anaerobic digestion as a means of generating methane for commercial use is a growing practice (see Anaerobic Digester – CNG/Co-Gen Flow Sheet). The sludge produced from the digester has traditionally been sent to sludge dryers, sludge ponds, and/ or spread on fields. However, these techniques can be expensive and subject to restrictions due to regulations, seasonal conditions, etc. This is a system to process digester sludge and produce saleable byproduct streams as well as a clean water stream which can be used for process use or even boiler feed. There are many challenges with processing this waste stream and care must be used to properly design the system to handle the various contaminants. Feed to the drum screen is from the anaerobic digester with liquid effluent flowing by gravity to the screw press. Solids from these units move by gravity to the solids transfer screw conveyor. Periodically, water is sprayed on the drum screen to clean the screen. These two devices remove large solids, straw, and other debris which has passed through the digester. The liquid from the screw press flows by gravity to the centrifuge feed tank and is pumped to the centrifuge. The centrifuge is the pretreatment to the ultrafiltration (UF) units and removes 50–60% of the suspended solids. The solids removed by the centrifuge are of the size distribution which would readily foul the UF units. Spiral wound membranes are used in the UF units. The UF units produce two streams – the concentrate and the permeate. Both of these streams are valuable byproducts and have worth as liquid fertilizer. The concentrate stream contains the concentrated suspended solids. Although this stream is a good fertilizer, the suspended solids restrict its use to the pre-emergence timeframe of the crops due to the fact that the solids can coat the leaves and “suffocate” the plants. A means must be provided to store the liquid until it can be used in the spring. All the streams used for liquid fertilizers are most economically applied by means of a center pivot irrigation system. The permeate is virtually free of suspended solids and can be sprayed on crops throughout the growing season. Additionally, it makes a very good feed to reverse osmosis (RO) units if maximum water recovery is desirable. If reverse osmosis is used, the concentrate also has value as a liquid fertilizer. In this flow sheet the RO permeate is recycled to the digester. In this flow sheet, the anaerobic digester is using feedlot manure as the feed source. This material requires the addition of water to prepare it to the digester. RO waste is used for this purpose since it is very low in total dissolved solids (TDS) and prevents the buildup of dissolved salts and minerals in the digesters which would have an adverse effect on their performance. However, as noted above, this water could be used for a variety of purposes, including process water or boiler feed water. The clean-in-place (CIP) chemicals used in cleaning the UF and RO are generated in small enough quantities that they may be recycled to the digesters. This means this treatment system generates virtually no waste products and that all liquid streams and solids generated by the system are valuable byproducts.